Right now there appear to be three main sources of concern for bulls: high-yield bonds, the Transports, and the slope of the yield curve. Let’s examine each of these individually to see if they warrant a change in our longer-term outlook. First up is junk bonds. Last week was the first time in eight weeks that major indexes posted losses, and that weakness may have been presaged by declines in junk bonds, as seen below. Junk bonds are highly correlated with equities and tend to be one of the first areas investors look to sell when they want to raise cash. The price action in this daily chart certainly looks ominous, but if we zoom out to a longer-term perspective, we can see that no major technical damage has been done. The bullish pattern of higher highs and higher lows remains in force, with support sitting around 36.25. That level also coincides with the 200-day moving average, which is likely to help buffer a downside move. However, there are two developments that could add more fuel to the bears’ fire. If JNK falls below 36.25, it will break the bullish trend by setting a lower low. This, combined with the recent higher high, would essentially put us in no man’s land, leaving a big question mark as to JNK’s near-term direction. 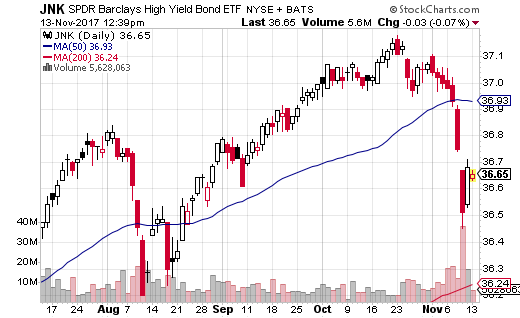 The other development that could work in favor of the bears is if JNK falls to near 36.25 but then rallies. In this case, we would need to be on alert for the development of a possible head-and-shoulders top. That pattern would be completed by JNK rallying off the 36.25 level, failing to set a new high on that subsequent rally, and then falling below the newly created “neckline” at 36.25. 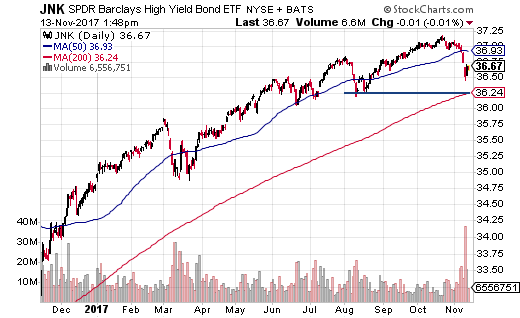 So either way, it may take a bit of time before we know if the bullish trend in junk bonds is set to reverse. Next, we have the Transports. 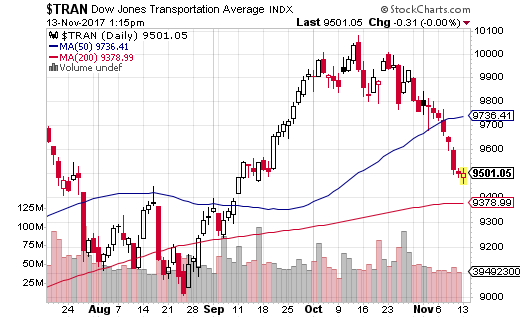 The Transports have been declining over the past month and last week fell below their 50-day moving average. Considering that the Transports are still viewed as a leading index, it’s worth taking a longer-term view of their price action to see if anything major has changed. In the chart below we can see the price action in the Transports over the last 12 months. As you can see, this index has been quite volatile. While the recent pullback has been substantial, I don’t think it’s worth reacting to just yet. This is because once again the bullish pattern of higher highs and higher lows remains in full effect, and we also still have the 200-day moving average as support. But while the primary trend here remains bullish, this latest drop is cause for concern regarding Dow Theory. The Industrials currently remain very close to their all-time highs and are likely to continue setting new records in the weeks ahead. 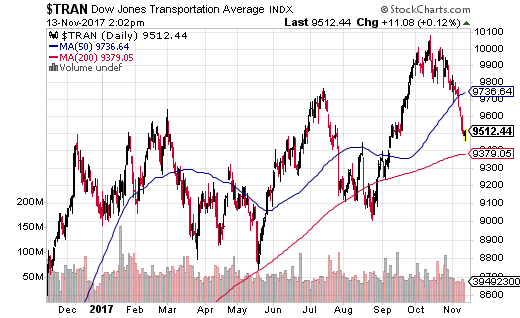 But based on how far the Transports have fallen, rallying above their previous highs to reconfirm strength in the Industrials may take some time. This could leave us with a series of non-confirmations, which would not be outright bearish, but may cause us to question the strength of the rally. At this stage, however, without anything close to a downside confirmation, we must give the prior Dow Theory bull signal the benefit of the doubt. One of the other pressing issues on investors’ minds is the gradual flattening of the yield curve that we’ve seen in recent months. As you can see in the chart below, the slope of the yield curve is the flattest it’s been since the end of the financial crisis. We all know how reliable of an indicator an inverted yield curve is, so should we be worried? In my opinion, not yet. We know that a flattening yield curve does not portend great things for the economy, but a flat yield curve in and of itself also doesn’t mean a recession is imminent. Even though once the yield curve inverts, there is typically a six to twelve month period before the onset of the subsequent recession. Also, we must consider WHY the yield curve has been flattening. Believe it or not, the yield on the 10-year note is at almost exactly the same level where it began the year, right about 2.4%. This means that the reduction in the spread you see in the chart above is completely the result of a rising two-year yield. And of course, that is a direct result of the Federal Reserve raising their target for the federal funds rate. 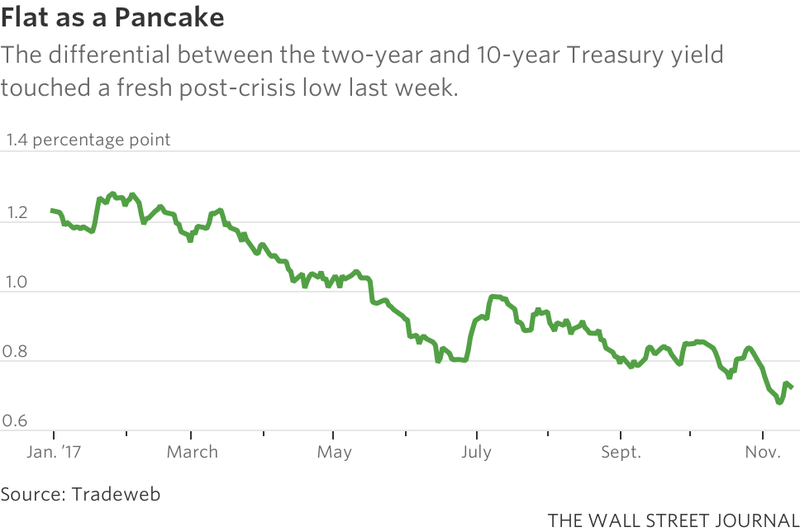 So … all of the flattenings that we’ve seen this year is essentially due to the Fed. Now, this may calm your nerves, or make you extra jittery, depending on how you view the Fed. If you still see the Fed as embarking on preset rate hike “cycles” then you’re likely to be concerned that the Fed will continue raising rates in the face of deteriorating economic conditions, ultimately pushing us into recession as they’ve done in the past. But if you think that the current (and incoming) Fed leadership has learned anything from their prior mistakes (this is my view) then perhaps there is less reason to be concerned. Looking at the yield curve above, and the recent inflation readings, which continue to come in well below target, it’s difficult to make a case for the Fed continuing to raise rates for any reason other than to get further away from the zero bound. The Fed has also been extremely vocal about how the real natural rate of interest (r-star) has been declining over the past decade. What this means is that the Fed’s upper bound on the federal funds rate is significantly lower than it was in the past. Translation: we’re not going to see substantially higher short-rates ahead, as the economy can no longer stand them. Now, with all that said, I must admit I’m a bit unnerved to see how strongly the market is pricing in an expected rate hike next month, but I understand why. In recent years the Fed has come to rely on a forward guidance as one of their most influential policy tools. 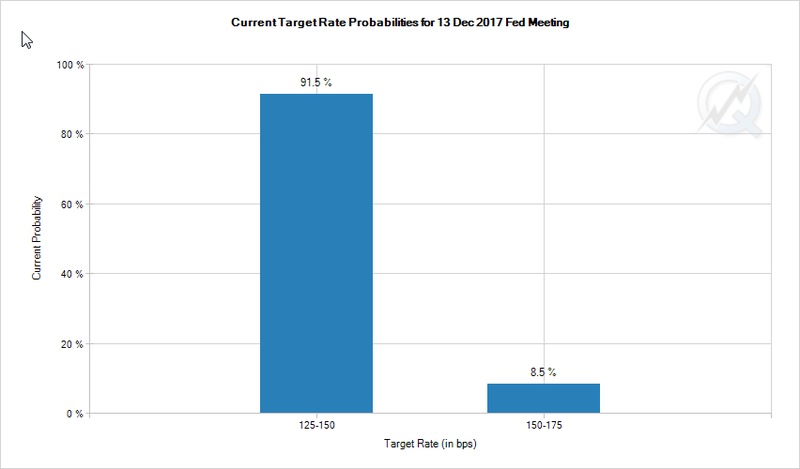 And the Fed has flat out told us to expect a rate hike in December, so … lemmings that investors are, they take this “common knowledge” and price it into the markets. Also, we just recently locked in two-quarters of 3% GDP growth for the first time since 2014 … So if you’re an opportunistic Fed looking for a little more breathing room (restocking the policy toolkit for the next downturn), then here’s your opportunity. But even if the Fed raises rates in December and signals that more rate hikes are ahead in 2018 (a near certainty), this does not mean the yield curve is destined to invert or the economy is doomed to a recession. I believe the Fed truly is more data dependent than they’ve been in the past, and that it’s unlikely they’ll invert the yield curve by their own doing … again. One last comment on this is that if the yield curve does invert, and it’s a function of the long-end falling rather than the short-end rising, then we REALLY should be concerned. Collapsing long-term yields would be indicative of the economy falling back toward the deflationary abyss, something none of us want to see. While there is always a host of concerns for bulls to worry about, right now the primary areas of weakness do not appear to be harbingers of an impending change in the primary trend. We’ll continue to monitor as conditions evolve, but right now investors should stay the course until further developments arise.